Yeast manufacturers are pretty good at manufacturing yeast. Making beer......... not necessarily. I agree with both of you: sumthin ain’t right. I also think at those quantities the result should be much lower than BS tells me as well which is why I poked the numbers in Brewer’s Friend to compare them. Dave, I am using whole hops. I plan 6.5 post boil and 5.5 in the fermenter. I want 10 IBU(s) each of the Aroma and Flavor hops. 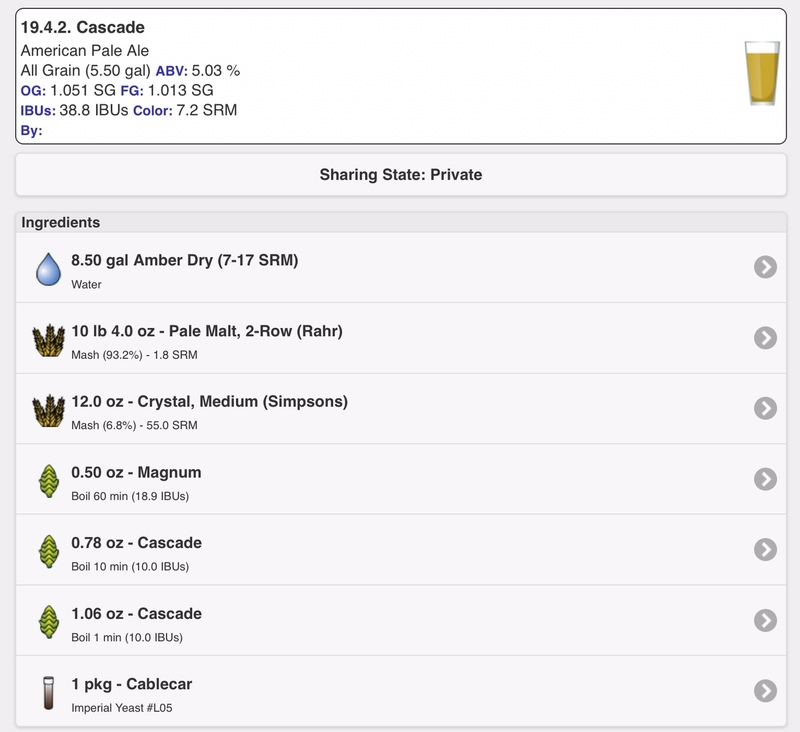 Your batch size is clearly 6.5 gallons then, regardless of how much you actually end up with in the fermenter. Why the waste of a gallon anyway? Is that for lost wort due to using all whole hops? I realize that the IBU number itself is based on each brewery and a correlation to what the drinker perceives. My question pertains to calculation of that number. 1) Volumes -- This is the biggest one. Your first entry in Brewer's Friend says 6.5 gallons, versus BeerSmith says 5.5 gallons. That will have a huge effect. 2) Late hop additions in BeerSmith look way off to me. Should be much lower in single digits, not 10 IBUs each. 3) Are you really using whole hops? In Brewer's Friend you specify whole hops. Not sure about what you put into BeerSmith. But make sure those are consistent between the two softwares. 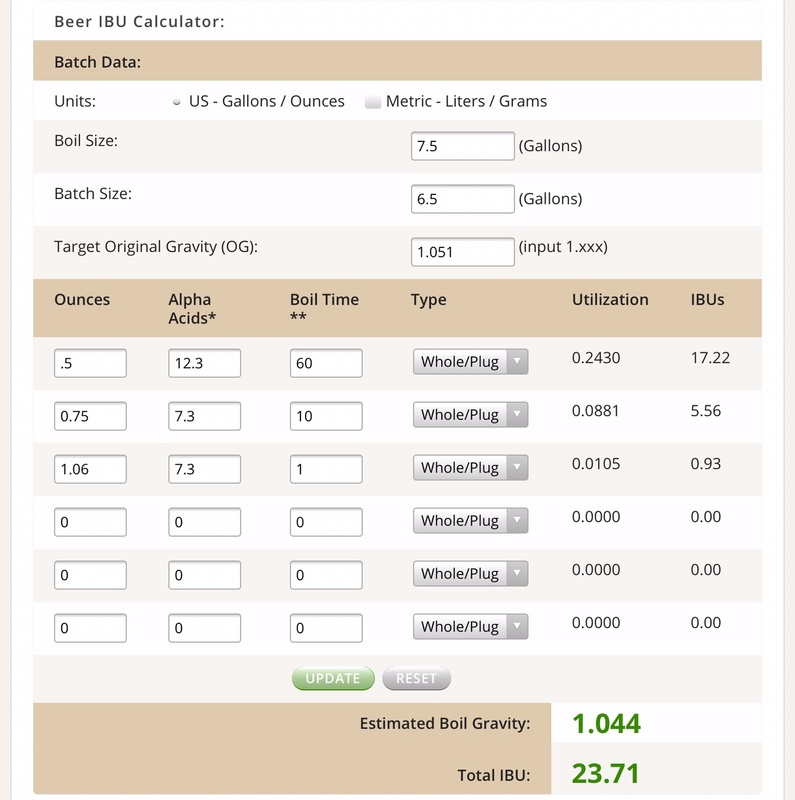 If whole hops and 6.5 gallons, I calculate about 26 IBUs. Otherwise.... well, it depends on all 3 of those things above. Martin, can you comment on the fact that a lot of malsters and other sources say that most of the conversion takes place in the first 10 minutes of the mash? Although I agree that mash pH tends to rise throughout the mash, I have always been a bit of a stickler to assure that I within the 5.2-5.6 range (at room temperature) early on because the enzymes are happier during the time period where the bulk of the conversion takes place. +1. I typically only mash for 45 minutes, so I want the pH in the right range right away. That time goes fast. On other other hand.... I only measure pH about half the time or less. Often I forget, and/or don't care. AFAIK, there is nothing inherently good or bad about mashing at any specific ratios. There's nothing magical about the ratio. However I do think the SPARGE VOLUME has something to do with efficiency. Not the mash ratio, but the volume after mashing that you then have left to sparge with to reach your intended pre-boil volume. Volumes matter. But not the ratio. For high gravity beers (more than about 1.080), I use thicker mash 0.8-1.0 qt/lb, bigger sparge, and longer boil, to maximize efficiency. Big sparge, big volume, better efficiency. This just ensures a very good rinse of sugars out of the grains, that's the reason I do it. Less rinsing could be leaving behind precious sugars. I mean.... if you were to mash 20 lbs grains at a ratio of 3 qt/lb... you might not be happy with the 13 gallons you then have to boil after that, and that's without even sparging, so you'll be leaving some sugars behind in the spent grains. Conversely, if you mash the same 20 lbs at 0.9 qt/lb, you'll get only about 2.5 gallons out of the first runnings (assuming batch sparge though the concept isn't super different for fly sparge), but you can then sparge with another 4 or 5 gallons which is an excellent rinse that won't leave much sugar behind (assuming a post-boil 5-gallon batch size), though you might possibly run into a high pH concern if you fly sparge. For standard to low gravity beers, I usually use anywhere from 1.3-2.0 qt/lb, and haven't noticed any real effect on efficiency from various ratios. I just do whatever, whenever, doesn't seem to matter much. The golden amount, in my opinion, seems to be roughly 1.5 qt/lb, plus or minus. But I have used all sorts of ratios above and below that, and don't really much care about the exact ratio on any given batch. I don't recall the exact ratio for a low gravity beer, like say for a Scottish ale of 1.038 OG or whatever, but in an instance like this, I'll typically plan to skip the sparge as it's just not needed, so I'll add the entire volume needed for pre-boil to the mash, based on boiloff rate and batch size, drain the mash and immediately begin heatup to the boil with no sparge. If that ratio is 2 qt/lb or 3 qt/lb, I don't recall, and just don't care -- whatever it is, I'm not afraid to do it, as a small gravity beer really does not need a sparge so the only critical number is the volume you get out.... and I wouldn't want to put more water in than necessary so I'd run a calc and make sure I put in just the right volume so that nothing is wasted. THAT is efficiency: Calculating things out so that you never use too much grain, not enough grain, too much water, not enough water..... for those who care about efficiency. After 20 years, I still haven't decided if I care or not. Meh. As long as everything is predictable and reasonably within expected parameters, I'm pretty happy. Which is, like, 95% of the time. Another thing is that for good accuracy, it needs to be calibrated, and re-calibrated, and re-re-calibrated, prior to every use, IF you want it to be very accurate within 0.001-0.002. Maybe I've just gotten lucky, but I've never had to calibrate or re-calibrate my Tilt. It consistently reads .002 lower than my hydrometer. Maybe I could correct that with calibration, but I don't really see the need. Undermodified malt cannot be bought. Not available anyplace. I've looked (at least a few years ago I did). Cool. I'd be interested to see the spec sheet on that, maybe try a decoction batch with it sometime. Better yet, do another side-by-side experiment single infuse vs. decoct to see what it does. Thanks. Meh. I'm pretty laid back, go with the flow. Political type discussions generally do not excite me. I for one intend to kick back, relax, and not worry. *EDIT Yep, ran some records through. "Old cubic" gives me virtually the same FG results as Petr's as published in Zymurgy (also used by Brewer's Friend) gives, which I've confirmed by saccharometer. Yupper.... me too. Almost identical within fractions of an SG point. The most accurate formula for me is "Old Cubic", by a hair. But I did steal and customize Mr. Terrill's spreadsheet and for that I am very thankful. I'm pretty sure that when I talked about Briess being under modified originally my source was Briess directly. I'm just the messenger! Don't shoot me if Briess is being a little too cute! Briess does indeed insist that some of their malt is a little undermodified. BUT.... it just isn't true. I wouldn't say it's "undermodified", but rather it is "SLIGHTLY less well modified than many other malts" -- that would sort of be true. The Tilt requires Bluetooth technology and/or faulty phone app... which for some reason tends to get disconnected every 2-6 hours, at least that's been my experience but I know for certain I'm not the only one, I've heard reports of same or similar from several others. This means we need to manually unclick and re-click the Bluetooth connection every so often to re-establish connection. Not a real big deal unless you're going to be away for a whole day and REALLY NEED to know the exact SG at all times..... personally I don't sweat it too much, I just enjoy seeing the trend and knowing when to change temperature or dry hop or whatever. On the other hand, you're about equally likely to be one of the lucky people who never have this problem. Flip a coin. Maybe you'll be lucky. I'm never so lucky. Another thing is that for good accuracy, it needs to be calibrated, and re-calibrated, and re-re-calibrated, prior to every use, IF you want it to be very accurate within 0.001-0.002. If that level of accuracy isn't important, great, skip the extra calibration steps and you'll still be happy. But if you're retentive like I am, the extra calibration necessary is a little bit of a pain. Personally I'm pretty content (so far, anyway) to deal with it because to me it's worth the little extra effort. The other touchy thing with Tilt is that after it has krausen and/or hops stuck to it, it tends to read low by approximately 0.002 or thereabouts (in my experience). But as long as you know this, you can easily correct for it at the end of fermentation. You can gently shake the fermenter to get some of it off, or just live with a reading that's a little off. Alternatively........ I really really REALLY love my refractometer, now that I know how to use it correctly. See link from my previous post above. It's friggin awesome, and accurate within 0.001-0.002 every time without a lot of extra calibration steps. A couple drops and you're good to go -- how easy is that! And cheap! Nice resurrect to get this forum moving again. We needed a good kick in the pants. Refractometer works just fine as long as you learn your correction factor (mine is 0.99) and use the Brewer's Friend calculator or equivalent. The website does explain how to figure out the correction factor. I've modified the recipe, what do you think? It's seems like an American blonde ale? Still too hoppy for an American Blonde Ale, but getting closer. Don't add any hops at 5 minutes remaining in the boil, then it will be right.